In which everyone gets trolled, even the elevator. This one came out a day late because I needed the extra time to put all my cluttered thoughts into words. I like this episode an awful lot, and I always have, and I’ve never completely understood why. But it’s wedged in my brain as one of the more memorable episodes of the Black Rose Saga (to be honest I can’t even remember how the darn thing ends, but I sure as shootin’ remember the freaking Onion Prince), and maybe one of the more memorable episodes of the series as a whole. Part of this is definitely the story structure, as it gleefully sets up and then subverts the formula we’ve come to expect from Black Rose dueling episodes. Of course if we pay attention we know this episode can only end the way it does, because who would be Tatsuya’s duelist? He’s connected to Wakaba, another of the “unchosen” (and judging by the episode preview, the focus of next week’s episode), making him twice removed from the action and doomed right from the start. Like Russian nesting dolls, the structural subversion fans outward, though: Not only does this defy our Black Rose expectations, but it defies expectations about fairy tales, and romances, and the idea (ideal?) 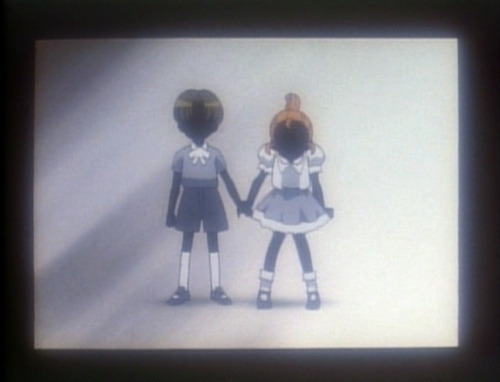 of the “totally normal guy” getting the “totally normal girl.” As the episode’s storyboard/writer Hashimoto Katsuyo remarks in an interview, “In any other show, Wakaba and Kazami [Tatsuya] would be the ones at the core of the story,” and despite all the subversion that’s come prior, I think there’s still the sense that this will be the one time Utena goes with the traditional love story (from the Nozomi Special Edition box sets). 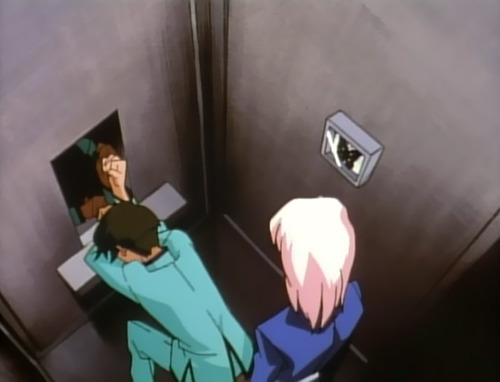 But of course it’s all one big tease, so thorough that even Mikage gets dragged into it, his Elevator Confessional hijacked and a student for once turned away. I suppose that willingness to flaunt expectations has always stuck with me. I’m also admittedly rather fond of our Onion Prince and have quite a lot of sympathy for him, and we’ll be spending some time toward the end exploring the reasons for that. 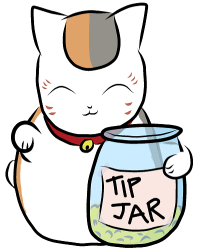 For now, though, let’s talk observations and expectations, two topics that are at the heart of this week’s tale. The Black Rose Saga has made it a point to check in with both the Student Council and Akio each week, and while I generally kind of avoid the Akio conversations because too much dramatic irony in the diet can lead to an upset stomach, I do like to talk about the StuCo, and this time I think the two scenes play off each other somewhat nicely. 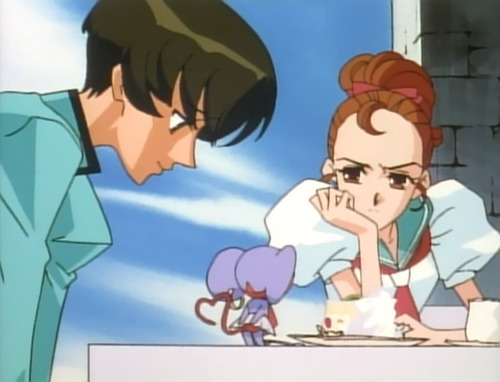 Akio’s conversations continue to be friendly but cynical—he’s told Utena that growing up means to “lose one’s radiance,” and this week he basically says you should give up on ever trying to understand someone else, because it’s a pointless endeavor. 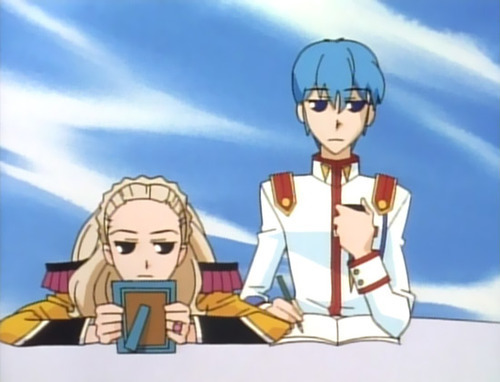 As he’s pretty much the only adult voice in the series (and has clearly gained some measure of Utena’s respect along the way), it’s a bit alarming to think that she may be taking his “words of wisdom” to heart. He’s gradually starting to exercise a kind of control over her through their conversations, and it makes you wish he’d turn his attention to someone else for a while. On the other hand, the Student Council have basically been forgotten by the story’s authority figures at this point, and in fact all three have been made pawns in a completely different game, with no “advice” from on high to help guide their actions. And it’s only here, finally, that we see them at last starting to drop their veneer of power and control and open up to one another—and they do so by discussing “the prince” within their own hearts. As always, the imagery on the StuCo Pavilion is pretty much perfect: The trio begin the scene all facing in different directions, but by the end they’ve more-or-less turned towards the round table between them (Jury remains in profile, because she still hasn’t revealed the identity of her “prince” to the others, but she’s entered the conversation and admitted to her own weaknesses, however quietly), which highlights the cohesion they are beginning to regain. Perhaps most importantly, unlike the cold, psychological partnership they maintained when Touga was in charge, this is an emotional unity, created through sharing secrets and letting their public masks slip, if only for a moment. Vrai describes this as the “flip side of the ‘unchosen’ theme,” noting that the StuCo’s “observed status” led them to become “abstracted idols tormented by interiorized complexes, and it was only in losing that observed status” that they are finally able to show their insecurities to each other. Granted, we “still have at least one shot observing the students through the Rose Seal window,” but there’s nevertheless a sense of freedom and even relief about the StuCo this week, as if they’ve relinquished the heavy crown that had been given them in the first cour (Episode 19). It’s a definite positive for all three of them, but it’s also concerning for those who are currently in that observed status—and particularly Utena, falling ever deeper under Akio’s watchful gaze. Why is it that “the path he must take does not lie here”? In any other show, a character like him probably would have been designed to gain the audience’s sympathy. 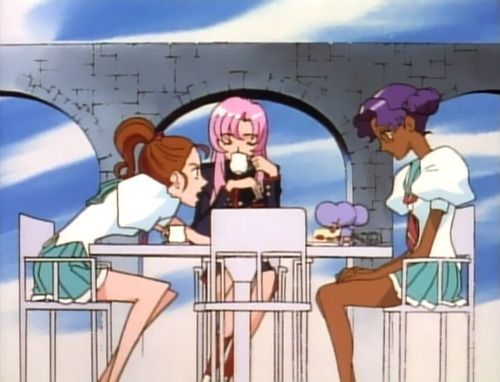 However, this is Revolutionary Girl Utena, and the Black Rose arc no less. Anyone to open the door must be baptized. There are many things in this world that don’t go the way you want them to. But even so, the onion girl is trying to be someone special. She’s fighting. Isn’t that exactly the story that the Black Rose arc is trying to tell? That’s why there’s no path here for the boy who’s decided to just pray for her happiness from the sidelines. …it’s a wish that won’t fight for anything or take any chances. It won’t break any shells, and the idea of it is to avoid the frightening prospect of opening yourself to a new and strange person who might hurt you. In other words, you’re never going to revolutionize anything. And for the moment, Tatsuya doesn’t seem bothered by that. (A Song for the Kingdom Now Lost). While I’m not sure I agree that Tatusya “doesn’t seem bothered” by his current situation (more on that in a minute), I think the reading of Tatsuya as a passive, “living on the sidelines” type of character is exactly right. 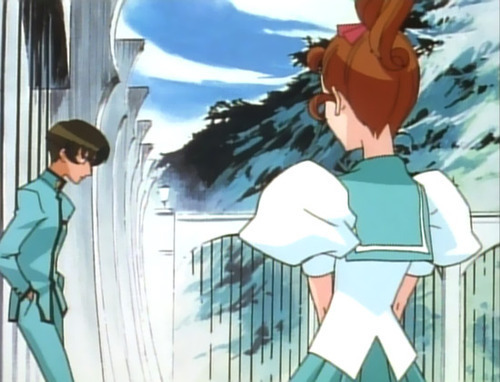 The closest he comes to taking chances this week is when kinda-sorta confesses to Wakaba (although even then it’s so vague and roundabout that she misunderstands entirely), but when she rejects him he decides to just sit and wait, ready to accept her if she ever comes back for him (and desperately convincing himself that she will). This is a dangerous way to live, to be sure, but it’s unsurprising. After all, Tatsuya has had the lie of the prince fed to him from childhood—whether he wanted it or not. The Student Council Arc often discussed the notion of roles and people getting stuffed into specific boxes (or coffins, as the imagery of Utena’s childhood suggests), and I think we see that theme in the foreground again this week. Tatsuya is something of the ultimate example of what happens when you get shoved into a role—by an individual or society as a whole—and what passively accepting that role can do to you. And I agree with this, but I also want to focus on the why of it—on how Tatsuya (and the many people like him) come to exist in the first place. We’ve talked at length about how these strictly defined roles are damaging for the “princesses,” promoting passivity and inequality, but this may be the first time we’ve really explored the flip side of these expectations, and what exactly it means to be a “prince.” For if a princess is “one who is rescued,” then a prince is just as much “one who rescues”—and if there’s no one who needs saving, then of what use is he to the story? The funny thing about so many popular fairy tales is that, for all that they’re often about passive girls who get rescued, they’re still about the girls—the prince is a plot point, a piece used to reach the conclusion, and a reward for the young woman who remained virtuous even in the face of great suffering. The prince is defined entirely by his relationship to the princess. So if there’s no princess, then what is the prince supposed to do? And this, I think, is the great tragedy of Tatsuya, a Nice Guy who did what he was expected to do and lived up to the “princely ideal,” only to discover that there was no princess for him to save. He’s as much a victim of social myths and expectations as any of our main characters, except that he’s in a position that’s considered “normal” or even “ideal” by the outside world. So, unlike the other characters who blame the broken system that rejected them and thus pound against the walls of their boxes, trying to “revolutionize the world” and their role within it, Tatsuya’s “role” is accepted by the world, at least in theory. And it’s so much harder to notice the box around you when everyone’s telling you it’s such a nice box and you should be happy to be inside of it. It’s a cautionary tale (much of Utena is, really) for the “good kids” of the world (self included), the ones who do what’s expected of them—be polite, work hard in school, make good friends, stay out of trouble—only to find that the ideal was a fantasy, and the world doesn’t work the way you were told. It’s not that the fault is always outside of ourselves, of course, but rather that it’s easy to buy into a broken or deficient system to the point where you believe that you’re the one that’s broken or deficient. Which, of course, only allows the system to thrive all the more. So I guess, ultimately, maybe that’s why the story of the Onion Prince stuck with me when I watched the show as a kid, and why I feel so much sympathy for him even now. Maybe it resonated because I saw a lot of myself in him. Hell—maybe I still do.